‘This was where her dreams drifted to if she didn’t blot her nights out with drink; this was where her thoughts settled if she didn’t fill her days with chat. She remembered this tiny, remote foreign village on a molecular level and the sight of it soaked into her like water into sand, because this was where her old life had ended and her new one had begun.’Portobello – home to the world-famous street market, Notting Hill Carnival and Clem Alderton. She’s the queen of the scene, the girl everyone wants to be or be with. But beneath the morning-after makeup, Clem is keeping a secret, and when she goes too far one reckless night she endangers everything – her home, her job and even her adored brother’s love.Portofino – a place of wild beauty and old-school glamour, and where a neglected villa has been bought by a handsome stranger. He wants Clem to restore it for him and it seems like the answer to all her problems – except that Clem has been there once before and vowed, for her own protection, never to return . 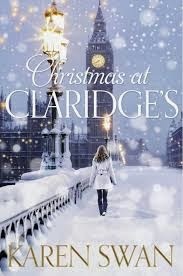 . .
Christmas at Claridge’s is the first book I have read by Karen Swan so I really didn’t know what to expect. The cover is beautiful, a soft, festive look and definitely one that would call out to me from the shelves. The storyline took me by complete surprise I really didn’t expect to find what I found inside this beautiful cover! Clem Alderton is a typical IT girl, out partying until early hours, looks to die for and friends and family to look after her in every way, she has been well and truly spoilt. From the outside looking in Clem looks like the cat that’s got the cream but a secret she keeps close to her chest, but when her wild ways end up causing so much damage that it looks as if she is about to lose her brothers love there is only one thing she can do to put things right but at the risk of her secret becoming exposed. I have sat here trying to put my thoughts about this book down to share with you but I just seem to be sitting here saying wow, wow and sighing heavily but I think you need more than that. When I first started this book I have to admit I didn’t think I was going to finish this one. Not only did I not relate to Clem who is our main character but I really didn’t like her, she was lazy, spoilt and shallow. I also couldn’t get into the storyline at first with a lot of focus on the bike, it just didn’t seem to flow and I just kept thinking I will give it until the end of this chapter and then stop. I am SO glad I didn’t give in because I really would have missed out on this little gem. The storyline started to develop more and there was also a touch of humour and then soon after this the story come full circle and I was gripped, I could not put it down. It was like reading about a completely different woman, things become clear a lot later on in the book as to why she acts the way she does and why she leads the life she leads. What really shone for me in this book is that the secret that Clem has kept for so long is so unexpected, there is a shadow that hangs all the way through book as we are waiting for a clue as to what the secret maybe but there was no hint at all. I just had to keep reading to find out what on earth she was hiding. To say I was shocked when I found out is an understatement, I was speechless, I don’t think I have ever read a book that has managed to keep me in the dark until the last few chapters! There are a vast amount of characters in this book and they all played a fabulous part. Stella provided the entertainment value to lighten the mood at times and Stella and Clem had a very strong, believable friendship. Tom was one of my favourites he was such a loveable character and his love for his sister just oozed through the pages. I loved the mystery that Rafa held and well what can I say about Gabriel that is one guy who will get us all hot under the collar, the passion was in full flow! The character who surprised me the most though was Clem as I said before I didn’t take to her at the start but by the end I loved her and my heart broke for her. This book is a real gem and one not to be missed. The storyline for me was breathtaking and so beautifully written. The author has a very clever writing style in concealing things from the reader in a way that doesn’t leave any room for guessing but that you never get bored of you are just eager to find out the truth. This will definitely pull at the heart strings, it certainly brought a tear to my eye. After reading this book I will certainly be picking up this author’s previous books. This needs to be under everyone’s tree this Christmas. Love your holiday blog theme. Great book to feature too. THANKS for sharing. Stopping by from Carole's Books You Loved November Edition. I am in the list as #28. My book entry is below.